Saturday, September 19 we welcome nearly 100 singers in Purcell, Britten and Holst to our opening camp activities on the beautiful campus of Madison Country Day School in Waunakee. Sunday, September 20, regular rehearsals at our Westgate Studios begin in earnest for Choraliers, Con Gioia, Capriccio, Cantilena, Cantabile and Ragazzi. Please plan to arrive extra early to be fitted for your concert wardrobe! Monday, September 21, Purcell, Britten and Holst have their regular rehearsals at our Westgate Studios. Please plan to arrive early to be fitted for your MYC polo. We have cleaned house at MYC over the summer and found many items that folks may be interested in owning (for very little money!). Vintage and recent MYC concert cd's, Boychoir Festival T-shirts, It's MYChoir gear, etc. Plan to stop by the sale table to take a look and please bring your checkbook or be ready with small bills as we will not be able to make change. Singers should bring their 1" black binder for music and a water bottle (if needed). Rehearsal begins promptly and the perfect time to arrive is 8-10 minutes before the beginning of rehearsal. Upon arrival, please check in with the rehearsal parent and find your seat. The MYC rehearsal table is staffed each week by Ian Disjardin, our Rehearsal Coordinator. If you have a question, he can point you in the right direction. Singers should plan to arrive at least 45 minutes before their scheduled rehearsal time to be fitted. Please make every effort to take care of this on September 20 as we are very limited in providing individual appointments for fittings during the week. For: new and returning singers in Purcell, Britten and Holst who need to be fitted (or refitted) with their MYC polo. Please plan to arrive early to rehearsal. We will stop fittings by 5:25pm so rehearsal can begin on time. Returning singers: if your current polo no longer fits, please return it! Boychoir concert wardrobe fittings (including Ragazzi) will take place in October. Cantilena: OPEN! Are you interested? Please email Lynn! Our fall sessions begin next week! If you have a younger singer in your family (age 7-10) interested in enrolling in our fall introductory choir program, we encourage you to register now as sessions are filling and once classes begin, we close registration. Classes are offered on Saturday morning (Monona location); Sunday afternoon, (Westgate) and Tuesday evening (Westgate). Registration is open on our website! Madison Opera is now accepting applicants for their High School Apprentice Program. The program offers juniors and seniors in high school the unique opportunity to explore and experience the world of professional opera. We have had many MYC singers participate in this amazing program over the years! Deadline to apply is October 9, 2015. Please visit Madison Opera for the application and more information. 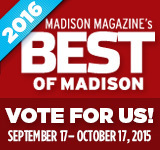 The Best of Madison annual poll of your favorites among favorites is now open and Madison Youth Choirs has AGAIN been nominated in the Youth Performing Arts section under Arts and Entertainment. You may recall, we won the Silver Award last year. Every vote counts...well, sort of. Keep reading! Voting this year requires a bit more of your time--be prepared to complete at least 25% of the entire ballot before your vote is counted. You may still vote once per day from each of your email addresses but no votes will be counted unless the ballot is at least 25% complete. How many categories must you cover to achieve this level of participation? According to our calculations, approximately 35. Have fun exploring the many, many categories on the ballot and thank you for voting!